Increased Early Season Vigor: Stimulates the plant’s hormones responsible for root formation, stem growth, fruit formation, and development. Higher Stand Counts: An increase in stand count of 12% at 14 DAE. Nematode Suppression: Protects against attacks by activating genes which produce protease inhibitors. Auburn University Trials to be released December 2015. 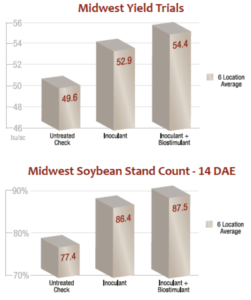 Higher Yields: Over six Midwest locations, an increase of 4.8 bushels over the control was demonstrated. Super Concentreated Liquid Inoculant: 10 Billion (1×1010) active Bradyrhizobium japonicum per ml Results in superior nodulation and higher yielding soybeans. 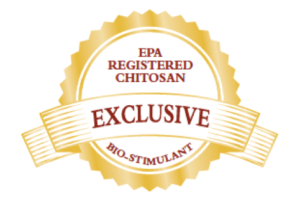 EPA Registered Chitosan Based Bio-Stimulant: Low Use Rate product contained in the rhizobium extender Biological plant immunostimulant which triggers a defense response within the plant, leading to the formation of physical and chemical barriers against invading pathogens. Low Viscosity Rhizobium Extender: Up to 30% thinner than the leading brands of extender on the market, thus eliminating treatment system problems and bridging or clumping of seed. Offers excellent time on seed compatibilities. 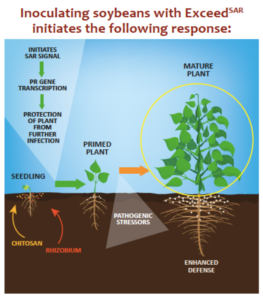 Systemic Acquired Resistance (SAR) is a mechanism of plant defense that provides broad spectrum protection against multiple pathogens including both disease and nematodes. ExceedSAR behaves like a general elicitor, inducing a non-host resistance and priming the systemic acquired immunity within the plants cellular tissue. The vasculature provides the excellent channel for transport of systemic signals. SAR takes 24-48 hours to activate the plant responses, and lasts the entire plant growing cycle. Involves gene activation and transmitted signal of chitinases, B 1, 3-glucanases and PR proteins.